Dhaka, 2 September, Abnews: Some fish just can't take the heat. And unfortunately, that's probably why an estimated 2,000 striped mullet (Mugil cephalus) suddenly died in Malibu Lagoon and Malibu Creek in Southern California last week. There are several species of fish that live in the coastal inlet of Malibu Lagoon, including the Southern California steelhead trout (Oncorhynchus mykiss irideus) and the tidewater goby (Eucyclogobius newberryi). But the striped mullet was the only species to go belly-up. The precise cause of the mass fish mortality is still unclear, but California State Parks officials are working to find the answer. So far, the most plausible explanation is the higher-than-average water temperatures in the lagoon: 80 to 82 degrees Fahrenheit (27 to 28 degrees Celsius). Those temperatures are thought to be the upper limit in which striped mullet can survive, California State Parks officials said in a statement. High water temperatures can also decrease the amount of dissolved oxygen in the water and may promote increased bacteria and algal growth. But striped mullet are generally tolerant of low oxygen levels, so that's probably not the culprit in this case. 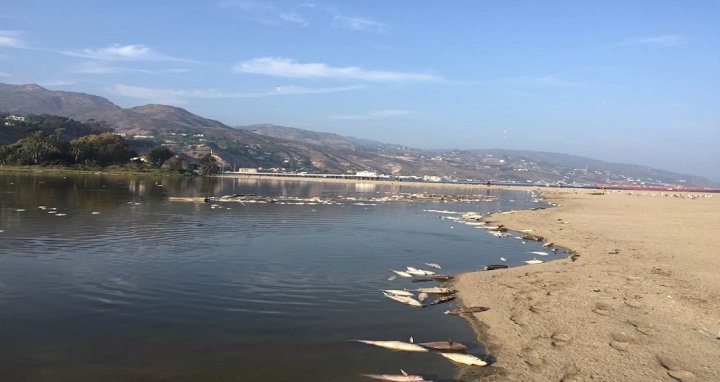 According to the statement from California State Parks, the habitat and water quality of Malibu Lagoon have improved significantly since the environmental restoration project in 2013, although smaller-scale fish die-offs still occur occasionally. Striped mullet are common in the coastal lagoons of Southern California. The fish are bottom-feeders that eat organic debris, bacteria and small invertebrates. Adults reach about 18 inches (46 centimeters) in length and 3 lbs. (1.3 kilograms), and in early to midwinter, they move offshore to spawn, according to the Smithsonian Marine Station. Craig Sap, superintendent of California State Parks' Angeles District, told the Los Angeles Times that this was the largest fish die-off he'd ever seen in the area. But as the Los Angeles Times reported on Aug. 27, California has been experiencing a summer of extreme heat, with record-high ocean temperatures from San Diego to Los Angeles. The warm water temperatures may have simply cooked the fish to death. Typically, it's preferable to leave dead fish where they are found and let native wildlife scavenge the remains. In this case, however, the California State Parks staff decided to remove them because the large number of decaying carcasses were close to popular beaches.